Furniture For Small Spaces. Try Open Shelves. 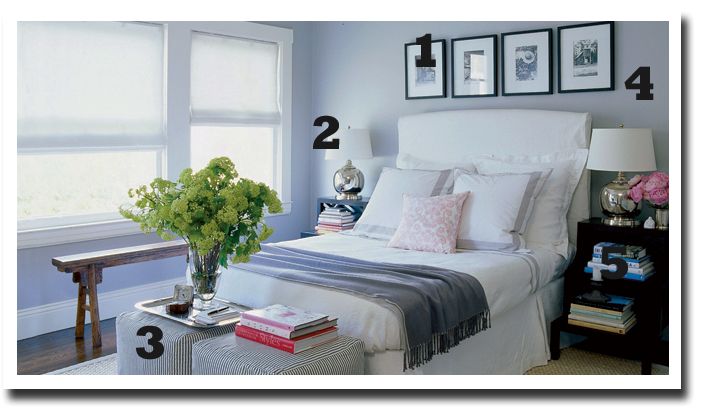 I really love this serene bedroom featured over at Elle Decor. I've spotted 5 small space solutions that you lovely readers can easily interpret in your own small space. 1 | The frames are placed higher on the wall, drawing the eye up. This is a nice use of wall space. 2 | The symmetry of the matching lamps creates a nice weight in the space, providing balance. 3 | The matching ottomans at the end of the bed have many uses - extra seating, place for storage, anchor in the space. 4 | The tall headboard and the frames feel like an accent wall while the other walls are clear and simple. 5 | These tiered side tables work better then a single drawer option and provide tons of extra storage for book and knick knacks. See the entire *gorgeous* apartment right here. Personally, I am loving this design style and use of space. I'm immediately stashing this look in my DREAM HOUSE FILE. It's beautiful! I think that the way the bed is made is also works really well for a small space. The statement made from the large pillows and headboard make the room feel more important. It's the hotel-effect.